On this exploration of the magnificent Galapagos Islands you will stay at local hotels and eat at local restaurants. This 8-day program will take you to the main attractions of the Galapagos Islands with visits to San Cristobal, Santa Cruz, and Isabela. You can marvel at the sheer variety of nature present here. Marvel at creatures like giant tortoises and hammerhead sharks. You can also indulge your adventurous nature here by practicing on sports like kayaking. You will hike up to the gorgeous Sierra Negra Volcano as well, and go snorkeling at the world famous Kicker Rock. These days will surely be an experience which you will remember and cherish for a lifetime. For rent: wetsuit (recommended between May – November): $5/per person per day – cash only. Your English-speaking guide will be waiting for you at San Cristobal airport. Today you will visit the San Cristobal Interpretation Center, where you will learn about the islands, the evolution of their species, the fauna, migrations, and how humans came to live here. Then you will go to Playa Mann for your first contact with the waters of these islands. After breakfast, sail off to snorkel at the famous Kicker Rock. 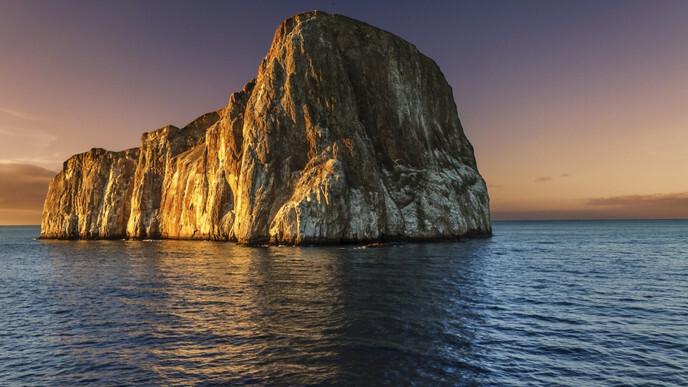 This is one of the most spectacular landmarks in the Galapagos Islands. It consists of two 140m tall volcanic rocks, located off the coast of San Cristobal Island. When viewed from the south the rocks look like a sleeping lion, which is why the Spanish name is León Dormido. From another side it looks more like a boot, hence the English name: Kicker Rock. This magnificent tiny island is the favorite place for an array of marine birds. But it is in the sea where you will see a huge variety of underwater life. The natural erosion of this ancient cone has created a channel between the rocks providing the ideal habitat to view a variety of sharks and rays including eagle rays, white-tip reef sharks, and sometimes even the Galapagos shark and Hammerheads! Early in the morning you will take the public speedboat from San Cristobal to Puerto Ayora, where your guide will be waiting for you. You will have breakfast and drop off your luggage at the hotel. 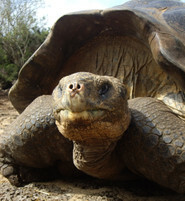 Around 10:30 AM you will visit the Charles Darwin Research Station, where you can see the last living Galapagos tortoise. 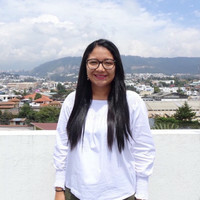 In the afternoon you will go to the Highlands of Santa Cruz to make closer contact with the giant Galapagos tortoises in their natural habitat, as well as many kinds of birds like the wizard and finch. You will be surrounded by the endemic vegetation of the Galapagos throughout the whole excursion, such as escalecias and matazarnos. You will have lunch here. In the evening you will have a special dinner organized to show you the gastronomy of the island. This morning is yours to spend at your leisure. You can explore the area by yourself. In the early afternoon, take a public speedboat to Isabela Island. Upon your arrival in Isabela, you will visit the Flamingo Lagoon. This place is the largest coastal lagoon found in Galapagos and it is one of the main reproductive sites for the majority of flamingos. Early in the morning after breakfast you’ll go on an excursion to the Sierra Negra Volcano. The Sierra Negra Volcano is located 13 miles from Puerto Villamil and has the second largest volcanic crater in the world. To arrive at this incredible sight you will travel to the Galapagos National Park, where you will begin the hike to the Sierra Negra Volcano. Stop for lunch before returning to the hotel. Afterwards you can go snorkeling or swimming by yourself at Concha Perla. Here, you can observe the colorful fishes, sea urchins, starfishes, sea lions, or even sea turtles. After breakfast your guide will take you to what is said to be one of the best snorkeling places in the world, Los Tuneles. The water is shallow, calm and very clear - a sea sanctuary. Lava flows have produced unique geological formations, a series of arcs and tunnels underneath and above the water - an ideal habitat for many local Galapagos species. The entrance to the site is shallow and the waves can be strong. For this reason, the access can be complicated. You will have lunch on board and then return to Puerto Villamil. After breakfast your guide will accompany you for a kayak excursion in the bay of Puerto Villamil. Marvel at the placid crystal-clear waters as you paddle across them. The afternoon is yours to spend at your leisure. You can use the time to enjoy the beautiful beach or to do another optional activity. Early in the morning you can take the public speedboat to Puerto Ayora. Then you will go to the airport by taxi. Your trip will end upon your arrival at Baltra Airport.